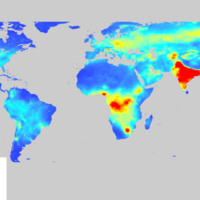 Satellite observations show that the rapid urbanization and emergence of megacities with 10 million or more residents has raised PM 2.5 concentrations across the globe during the past few decades. This talk presents an assessment of PM 2.5 trends from 1998 to 2016 for the 33 megacities included on the UN list of megacities published in 2018. The land in and around these megacities was classified into densely populated areas (> 1,500 residents per square kilometer), moderately populated areas (from 300 to 1,500 residents per square kilometer) and sparsely populated areas (<300 residents per square kilometer) and the effect of human settlement density on PM 2.5 concentrations in these areas over the period 1998-2016 is reported.